Wave superposition (sum of two waves moving in opposite directions). This animation shows two transverse waves approaching each other from opposite sides of a liquid (blue-green block). The left wave is highlighted by a yellow sine wave, while the right wave by a red sine wave. As the two waves approach each other, so they add together to create a new waveform. 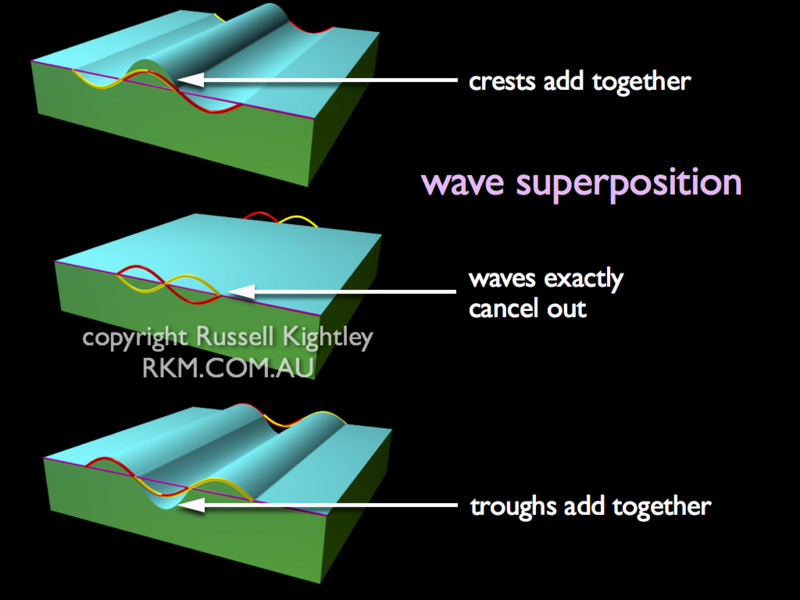 When two crests meet they create a larger crest (constructive interference), where two troughs meet, they create a deeper trough. When a crest meets a trough, they cancel out (destructive interference). At exactly halfway through the animation the two waves exactly cancel each other out and the liquid surface is perfectly flat. You can pause the animation and move the slider back and forth to check this out.